Line an 8-inch pie dish with pie crust. In a large bowl, stir together chocolate chip cookie mix, melted butter, eggs and chocolate chips. Pour batter into pie dish, spreading evenly to edges. Bake for 40-45 minutes, or until the edges of the pie turn dark golden brown. Remove and cool for 30 minutes. 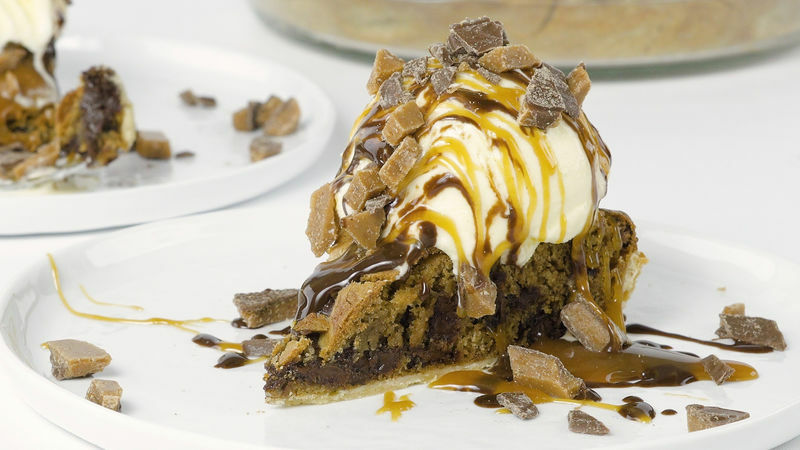 Serve slices topped with a scoop of ice cream, caramel sauce, chocolate sauce and a hefty sprinkling of toffee.